"I Was a Communist for the FBI--I walk alone." 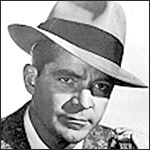 The 1952 syndicated series starred Dana Andrews as real-life undercover agent Matt Cvetic, whose book of the same title provided the inspiration for the radio series and a Hollywood film. Growing out of the communist paranoia of the McCarthy era, the Cold War drama featured red spies portrayed in the same stereotypical manner of the Nazis during World Ward II propaganda programs.